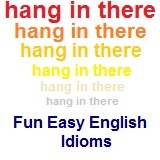 ﻿ Fun Easy English - new american english idioms letter k.
In this lesson you will learn American English idioms beginning with the letter K. You will learn the definition and study the usage of each idiom. KANGAROO COURT a court set up outside the regular legal system; staged trial where the outcome is set from the beginning 1. The rancher and his friends tried and convicted the horse thieves in a kangaroo court rather than let the sheriff take them to jail for a trial according to the law. 2. The political protesters had been tried and found guilty in a court of law, and when the verdict was read, they claimed that the jury and judge had not been impartial, and that they had been tried in a kangaroo court. keel over faint and fall over He thought that he was going to keel over because of the heat. keel over tip over The boat looked like it was going to keel over. keep a secret not tell others You should keep a secret about your new job. keep a stiff upper lip face the situation with pride The team could keep a stiff upper lip even though they were defeated. keep after keep reminding You should keep after her to do her homework. keep an eye on Watch Keep an eye on my bicycle while I order some coffee. keep at continue He has decided to keep at his studies at the university. keep body and soul together survive It was very cold during the winter but somehow she was able to keep body and soul together. keep books keep records of money gained and spent She used to keep books for a small company. keep down control The students were told to keep down the noise. keep from refrain from I could not keep from eating all that cake. keep good time accurately report the time My watch does not been keep good time lately. keep house look after household She likes to keep house more than working for a company. keep in touch stay in contact I have always tried to keep in touch with my friends. keep on continue She will keep on making the same mistakes. keep one's chin up continue and not quit Try and keep your chin up. Antonym: lose (one’s) cool, hot under the collar; see red 1. I know you’re angry, but you’ve got to try to control yourself. Keep your cool and don’t lose your temper. 2. It’s particularly important to keep your cool in a traffic jam. It’s so easy to get angry and have an accident. keep one's eye on the ball be watchful and ready You should keep your eye on the ball or you will make a mistake. The expression suggests that one’s eyelids are pulled back in order to not miss seeing anything. 1. I’m looking for a special edition of a book, and I haven’t found it anywhere. When you’re in the bookstore, please keep your eyes peeled for it, will you? 2. They planned to meet Joe on a crowded corner at lunchtime. He hadn’t arrived yet, but as people walked toward the corner, they kept their eyes peeled for him. The expression probably originates from a superstition that bad luck can be prevented by crossing one’s fingers. The expression refers to crossing one’s middle finger over the knuckle of the index finger. 1. Jane wasn’t sure that she had passed the test, but she was keeping her fingers crossed. 2. They are keeping their fingers crossed that the rain holds off and doesn’t spoil the picnic they have planned. keep one's head stay calm when there is trouble or danger He is a very good leader and is always able to keep his head. Keep one’s head above water and make ends meet mean having just enough money but no extra, although the former conveys a greater feeling of desperation. Keep one’s head above water can mean survival in a financial or other sense, whereas make ends meet always refers to a financial situation. 1. Mrs. Robinson has three children to support and she doesn’t make very much money at her job. She is barely keeping her head above water. keep one's mouth shut be quiet She was very angry and told him to keep his mouth shut. keep one's nose clean stay out of trouble He has been managing to keep his nose clean since he moved to the new town. The expression usually refers to monotonous work. 1. You will succeed if you keep working hard, but you have to keep your nose to the grindstone. 2. Kim is studying constantly now because she has final exams next week. She’s in her room keeping her nose to the grindstone. keep one's own counsel keep ideas and plans to himself He always seems to keep his own counsel. The expression is generally used in the imperative. It is used by an adult to children, a superior to a subordinate, or between two equals on friendly or intimate terms. 1. Will you keep your shirt on, Bob? You won’t get there any faster if you drive too fast and cause a car accident. 2. I know you’re hungry, but dinner won’t be ready for another ten minutes. Just keep your shirt on! Compare to: at (one’s) wits’ end, scared out of (one’s) wits 1. If she wants to do well in her job interview, she can’t daydream—she’ll have to keep her wits about her. keep one's word fulfill her promise She never can keep her word. keep pace with go as fast as It was difficult to keep pace with the other students. keep quiet remain silent Please keep quiet and listen to the instructor. KEEP (SOMEONE) AT ARM’S LENGTH to keep someone at a distance emotionally 1. You can’t expect people to be very friendly to you when you always keep them at arm’s length. 2. Craig thinks that if he keeps everyone at arm’s length, he won’t fall in love and get hurt. This phrase originates from the 1800s, when many men and women wore hats. The idea is to keep a secret in your head, underneath a hat. 1. Don’t tell Richard anything you don’t want everyone else to know. It’s impossible for him to keep anything under his hat. 2. I’m not telling anyone yet, but Tom and I are getting married. Keep it under your hat, okay? KEEP THE BALL ROLLING to maintain momentum; to keep some process going 1. The principal has done so much and worked so hard to improve this school. Who’s going to keep the ball rolling when she retires? 2. Mr. Preston had managed to motivate his employees to higher production levels, and he wanted to keep them going. He wondered how he could keep the ball rolling. keep the books keep records of money gained and spent The head of the accounting department will keep the books this year. keep track of record The company will keep track of the money spent on paper this month. The expression implies that one strains one’s financial resources when one tries to match or exceed the purchases or actions made by a neighbor. Jones is a common family name. 1. My wife seems to think that we should buy our children cars of their own just because most of our friends do. She seems to think we have to keep up with the Joneses. 2. Keeping up with the Joneses can be very expensive. Every time your neighbor improves his home or buys a new car, you feel you have to, too. KEYED UP full of nervous anticipation; anxious; tense 1. Stop pacing the floor. Relax. Why are you so keyed up? kick out of enjoyment from I get a kick out of watching him paint. The expression can be either disparaging or light-hearted when used about oneself or one’s relatives (sentences 1 and 2), or disrespectful and impolite when used about someone else (sentence 3). 1. I plan on spending all my money before I kick the bucket. I’m not going to leave a penny of it to my relatives. 2. Your father hasn’t yet made a will. He doesn’t plan on kicking the bucket anytime soon. 3. The old woman was a person everyone in the neighborhood disliked. There were not too many mourners when she kicked the bucket. KICK UP (ONE’S) HEELS to have a lively and fun time, usually at a party or dance. 2. Put down your work, get out of the house, and come to the dance. Why don’t you kick up your heels for a change? KILL TWO BIRDS WITH ONE STONE to accomplish two objectives with one action 1. I have to go to New York on business this Friday, and I’ve needed to get some new suits for some time. Maybe I can kill two birds with one stone: I’ll attend to my business in New York on Friday and Monday and do some shopping over the weekend. The expression suggests that the person is only as tall as a grasshopper’s knee and is therefore very young. It is often used with a facedown, open hand to indicate the young person’s height at the time. 1. I was just knee-high to a grasshopper when I first went fishing with my father. I couldn’t have been more than five years old. 2. Look how small these pants are! I must have been knee-high to a grasshopper the last time I wore them. Compare to: pull the rug out from under (someone); spring something on (someone) 1. The teacher threw me for a loop when she told me I had failed the exam. I thought I had done so well. 2. Alan was knocked for a loop when he found out he had won $5,000 in the lottery. knocked up pregnant My dog gets knocked up once a year. Similar to: talk through one’s hat 1. Rita’s interpretation of that artist is completely wrong. Don’t listen to her. She doesn’t know beans about it. KNOW IF (ONE) IS COMING OR GOING, NOT to be confused and disoriented. 2. First I packed all the wrong clothes, then left the bag behind, and waited for the taxi until I realized I had forgotten to call one. When it came, I couldn’t remember where I wanted to go. I don’t know if I’m coming or going. KNOW (SOMEONE) FROM ADAM, NOT to be unable to recognize someone because the person is a stranger 1. Who is that speaking at the podium? Is it the chairman? I don’t know him from Adam. 2. A strange woman approached us at the train station. I assumed that she was Mrs. Smith, whom we were supposed to meet, but it was hard to tell since we didn’t know Mrs. Smith from Adam. Know the ropes is more frequently used to describe knowing the procedures to follow in a situation (knowing how to do something), whereas know the ins and outs more often describes the complex and hidden details of a situation. 1. When you travel to a foreign country, it is wise to hire a guide if you don’t know the ins and outs of the place. 2. American businesses often hire host country nationals to help them do business in foreign countries because the host country nationals know the ins and outs of doing business with their own countrymen. Know the ropes is more frequently used to describe knowing the procedures to follow in a given situation (how to do something), whereas ins and outs more often describes the complex and hidden details of a situation. 1. Let Marilyn help you get the manuscript published the first time. She knows the ropes and she’ll save you a lot of time and effort. 2. You have to know the ropes if you want to get hired in this city. Employers are looking for people with connections and know-how, not untried youngsters fresh out of college. KNUCKLE DOWN to do one’s work seriously; to apply oneself fully; to get busy 1. The young man hadn’t been studying very much and now he was failing his courses. The student advisor told him he would have to knuckle down if he wanted to avoid being expelled. 2. Mary frequently complains that she doesn’t have enough time to finish her work. But if she would spend less time chatting and just knuckle down, she would get it done. Antonyms: stand (one’s) ground; stick to (one’s) guns 1. Don’t let society beat you down or make you be the way everyone else is. Don’t knuckle under. 2. The mob leader promised that they would never make him reveal his partners in crime, no matter how badly they treated him. He swore he would never knuckle under. Hey do you know any English idioms beginning with the letter K not listed on this page?